The road to success can be long, but you don’t have to go it alone. Learn how to step into an authentic mindset to create your personal victory. 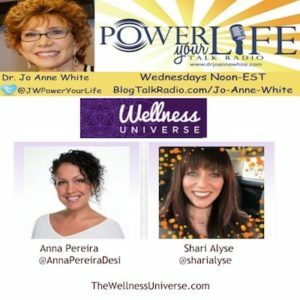 Anna Pereira, Founder of The Wellness Universe, is an inspirational leader who focusing on projects that take the collective energy and resources of World-Changers and put it into motion. Through the community of The Wellness Universe, Anna’s mission is to uplift, guide, and inspire people who serve those seeking wellness. Anna began The Wellness Universe with the belief that leaders of wellness need their own space and support and is passionate about bringing together a community of resources which support health, wellness and well-being. Her mission to serve as many as she can, stems from the trust that a happy, healthy, whole person is a conduit for peace. Shari Alyse is the Co-Founder of The Wellness Universe. Motivated by her own journey through healing from childhood trauma, her mission became evident: To help be the spark to reignite the light within everyone and bring joy back to people’s lives. Shari believes that we all have unique gifts to offer the world and once we learn to embrace, celebrate, and share these gifts, we truly can light up the world.